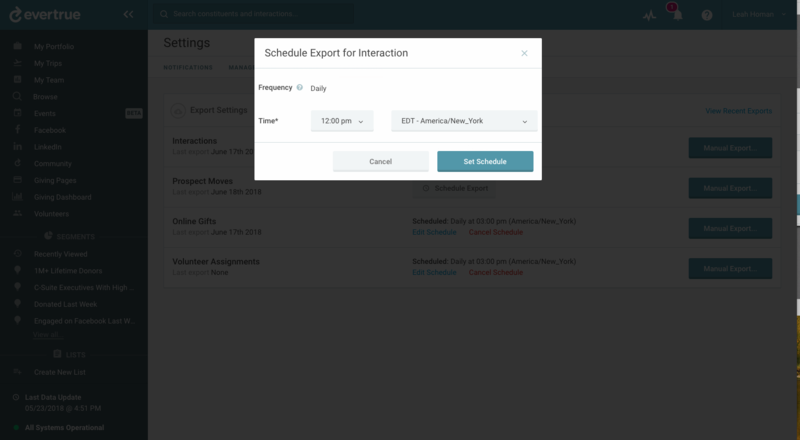 An exciting feature in EverTrue is the ability to schedule exports! Customers have the ability to schedule daily export files at a time they choose and have it delivered to them via secure FTP. The ability to schedule an export allows a customer to “set it and forget it," which minimizes the amount of time a Data Administrator needs to spend doing manual work. EverTrue's scheduled exports run daily at the time set by your institution (see below). All exported CSV files are delivered to the /exports directory via SFTP. If you do not have access to your institution's directory with EverTrue, let us know. If enabled*, a customer will see a “Schedule Export” button located in Settings > Export Data. 3. Choose a time zone (which defaults to your current time zone) and set the time you want the export to run - these are separated into 30-minute increments from 12:00AM-11:30PM. 4. Once saved, you have the option to cancel the export or edit the previous settings at any time. 5. Exported CSV files will be delivered to your institution's EverTrue /exports directory via SFTP and can be picked up at any time. All exports are timestamped for each recognition. What Timeframe is Included in an Export File? The scheduled export feature pulls interactions that have been written since the last time an export was run. So, if you are turning on scheduled exports for the first time, your first file will contain all interactions written in EverTrue. On a nightly basis, this will contain interactions written since the previous export. If an interaction is written close to the time of export, it will most likely not make it into that import file but will come out in the file for the previous day. For example, if your export runs at 7am EST, an interaction logged at 6:59am EST will most likely not be included in that day's file. EverTrue will always catch interactions that have not been exported yet and include them the next day. Ready to set up your scheduled exports? Let us know! *Constituent data exports via the Browse section of EverTrue cannot be automated at this time.